American communications technology satellite. One launch, 1993.09.12. NASA experimental communications; Advanced Communications Technology Satellite. Communication satellite built by RCA Astro => GE Astro => Martin Marietta for NASA, USA. Launched 1993. Used the AS-4000 bus. Status: Operational 1993. First Launch: 1993-09-12. Last Launch: 1993-09-12. Number: 1 . Gross mass: 2,767 kg (6,100 lb). ACTS was developed as an experimental on-orbit, advanced communications satellite test bed, bringing together industry, government, and academia to conduct a wide range of technology, propagation, and user application investigations. NASA Glenn Research Center awarded in August 1984 the ACTS contract to an industry team consisting of: Lockheed Martin, East Windsor, NJ for system integration and the spacecraft bus; TRW, Redondo Beach, CA for the spacecraft communications payload; COMSAT Laboratories, Clarksburg, MD for the network control and master ground station; Motorola, Chandler, AZ for the baseband processor; and Electromagnetic Sciences, Norcross, GA for the spot-beam forming networks. The contract was awarded to RCA Astro Space of East Windsor, NJ, which was subsequently acquired by General Electric, and then by Martin Marietta (itself acquired by Lockheed Aircraft Corporation in 1995 to become Lockheed Martin). In 1988, as a result of a congressionally mandated program funding cap, Lockheed Martin assumed responsibility for completing the development of the communications payload. Subsequently, Lockheed Martin (then General Electric Astro Space) subcontracted with Composite Optics, Inc. San Diego, CA for the manufacture of the antenna reflectors and part of the bus structure. ACTS was launched as the primary payload aboard the Space Shuttle Discovery (OV-103) from the Kennedy Space Center, Pad 39B, as part of the STS-51 mission on September 12, 1993. At launch and for insertion into its geosynchronous orbit, ACTS was mated to the transfer orbit stage component (TOS) for a total weight of 6108 lbs. On separation from the shuttle orbiter, the TOS was ignited to inject ACTS into geotransfer orbit. The TOS then separated from ACTS. At approximately 50.5 hours into the mission, the apogee kick motor injected ACTS into drift orbit. After seven days, ACTS, guided by the firing of spacecraft thrusters, moved into its operations orbit and transitioned to a stabilized spacecraft configuration. Before the payload was actuated, the solar arrays were deployed, earth-sun attitude control was established, and the main communication antennas were deployed. ACTS was stationed at its designated geosynchronous orbit location at 100 degrees west longitude. In July 1998 the spacecraft's north/south station keeping was stopped to extend operations in an inclined orbit. In August 2000, the satellite was moved to 105.2 W longitude to be permanently located. The weight of ACTS at the beginning of its on-orbit life was 3250 lbs. At full deployment, it measured 47.1 feet from tips to tip of its solar arrays and 29.9 feet across from its main receiving and transmitting antenna reflectors. Experimental studies began twelve weeks after ACTS was deployed. The communications payload continued to operate flawlessly 24 hours per day, seven days per week, year round. The only periods of "down time" occurred during parts of the spring and fall equinox periods when the ACTS' solar panels were eclipsed. Experimentation supported by ACTS continued until June 2000. In May 2001, the Ohio Consortium for Advanced Communications Technology began using ACTS for educational research. Type: 3-axis stabilized experimental communications technology satellite. Application: Testbed of new technology applications available to U.S. users. Launch Vehicle: Space Transportation System (STS)/ Transfer Orbit Stage (TOS). Orbit Position: Geosynchronous, equatorial, 105.2 degrees west. Frequency: 3 Ka-band channels, 30 GHz uplink, 20 GHz downlink. Bandwidth: 900 MHz each channel, 2.7 GHz total. Redundancy: 1 standby channel (4 for 3 redundancy). Coverage: Two contiguous sectors in north-eastern U.S. plus sixteen isolated spot beams covering selected U.S. locations. Also full visible earth coverage via mechanically-steerable spot beam. Receive Antenna: 2.2-m dish and 1-m steerable. Transmit Antenna: 3.3-m dish and 1-m steerable. EIRP: Isolated spot beams: 65 dBW; contiguous sectors: 60-65 dBW; steerable beam: 57 dBW. Receiver Noise Figure: 3.4 dB High Electron Mobility Transistor (HEMT). On-Board Switching: High speed programmable 3 x 3 switch matrix to provide three input and three output channels with 900 MHz bandwidth. Baseband processor provided demodulation, storage and remodulation of Low Burst Rate (LBR) data using two 110 Mbps TDMA/DAMA data streams assignable in increments of 64 kbits. Fade Beacons: Stable signals radiated from satellite in the uplink (30 GHz) and downlink (20 GHz) frequency bands to permit link fade measurements. Solar Array Output: 1418 watts (4 years). Battery System: 2 nickel-cadmium (NiCd) batteries of 19 Amp-hours (AH) each. No payload operations during eclipse. Power Bus: 35.5 (+/- 0.5) volts with full array illumination. Design: Blowdown hydrazine system with redundant thrusters and four tanks. Propellant: 580 lbs. (at launch). Thrusters: 16 (0.2,0.5, and 1.0 lbf). Station keeping: No longer maintained. (+/- 0.05 degrees when it was maintained). Structure: Length: 80", width: 84", depth: 75". Antenna Assembly: Height 116" above antenna panel; width: 29.9' deployed. Thermal Control: Passive temperature control: blankets and Optical Solar Reflectors (OSR); active temperature control: solid state controllers and heaters. Transfer Orbit Control: Autonomous nutation control during spin; initial pointing provided by Transfer Orbit Stage (TOS) booster. On-Orbit Control: 3-axis stabilized via earth and sun sensor and momentum wheel. Autotrack reference used during payload communications usage periods. Pointing Accuracy: 0.025 degree pitch and roll, 0.15 degree yaw using autotrack; 0.1 degree pitch and roll, 0.25 degree yaw using earth sensor. Offset Pointing Control: +/-6 degree pitch; +/-2 degree roll. Command Frequency: Ka-band primary; C-band backup and during transfer orbit. Command Rate: 100 pps FSK for bus functions; 5000 pps SGLS for payload. Command Capacity: 379 low rate discretes; 3 serial low rate data streams; 256 high rate discretes; 3 serial high rate data streams. Telemetry Frequency: Ka-band; C-band backup and during transfer orbit. Telemetry Format: 8 nits/word; 256 words/minor frame; 25 minor frames/major frame; 1024 bps. Telemetry Capacity: 312 bi-level words; 364 analog words; 6 serial words; dwell capability on any analog, bi-level or serial word. Tracking Frequency: Ka-band; C-band backup and during transfer orbit. Tracking Tones: 4 from 35.4 Hz to 27.777 kHz. 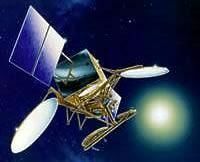 Family: Communications technology sat, Geosynchronous orbit, Technology. Country: USA. Engines: Star 37FM. Launch Vehicles: Space Shuttle. Launch Sites: Cape Canaveral, Cape Canaveral LC39B. Agency: NASA. Bibliography: 2, 279, 3555, 3556, 3557, 3558, 3559, 3560, 6, 6324.